The Château Narbonnais survived the Crusades but was dismantled in 1549. The Palais de Justice now stands on the site. Archaeological excavations have revealed some of the foundations of the old Counts' Chateau. 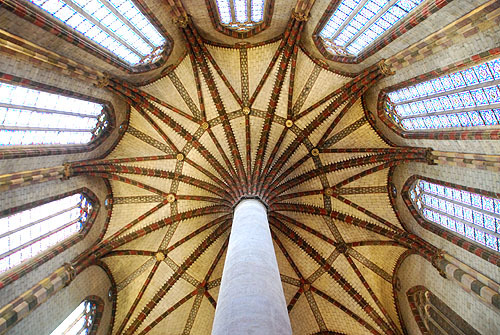 You can find much of the city's history commemorated by art in the Capitol in the heart of Toulouse. 16th to 29th of June 1211. 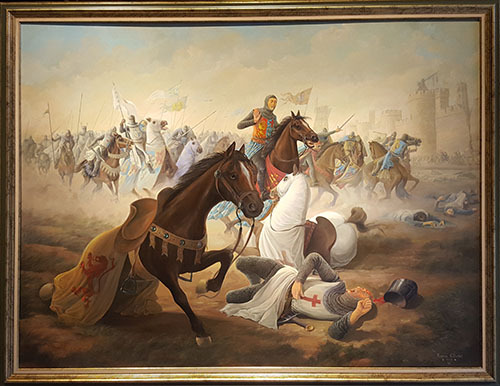 Simon de Montfort besieges the City of Toulouse, without success. May 1215. Surrender of the City of Toulouse to Simon de Montfort. 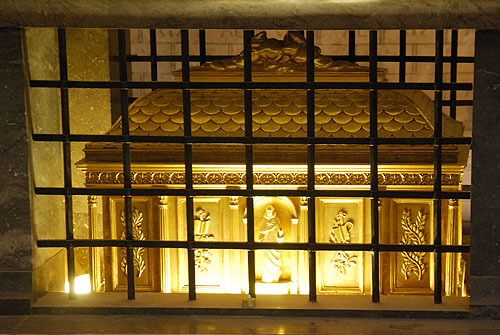 12th September 1217. 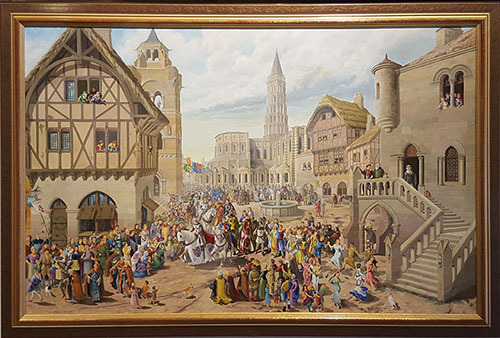 Raymond VI of Toulouse re-enters the City of Toulouse over the Bazacle (the ancient ford over the Garonne) to the delight of the population. Simon de Montfort's family are trapped within the Château Narbonnais. 13th September 1217 to 22 July 1218. 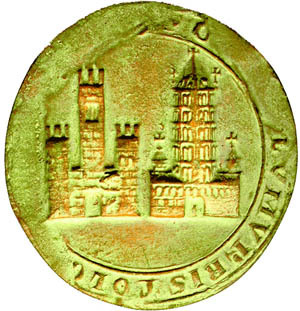 Second Siege of the City of Toulouse. 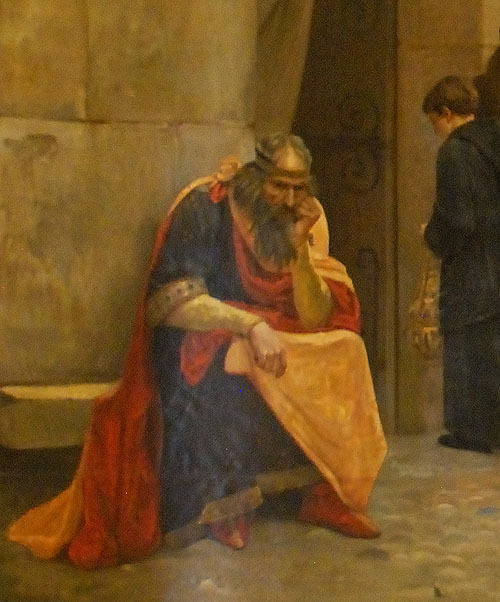 Stung by the humiliation of losing Toulouse, Simon de Montfort besieges the city again, without success. He dies during the siege, on 25th June 1218, hit on the head by a stone from a trebuchet, to the great rejoicing of the besieged, and the whole of the Midi. 16th of June - 1st of August 1219. 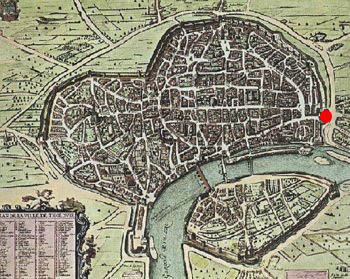 Third Siege of the City of Toulouse, this time by Prince Louis, the future French King Louis IX (Saint Louis), again without success. The Château Narbonaise was sited by the city walls of Toulouse. 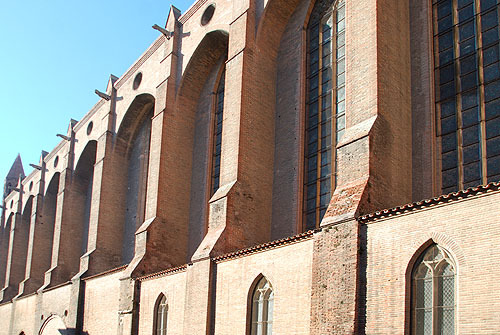 Today the palais de Justice - site of the Parliament of Toulouse - stand over the foundations of the medieval castle. (and the adjacent boulevard, Allée Jules Guesde, marks the location of the old city wall. After the Battle of Muret (13 September 1213), Simon de Montfort had taken the City of Toulouse. He had forced the inhabitants to demolish their defensive walls so that the city would be indefensible. He installed himself and a garrison in Raymond's palace, the château Narbonnais (which survived the Crusades but was dismantled in 1549). 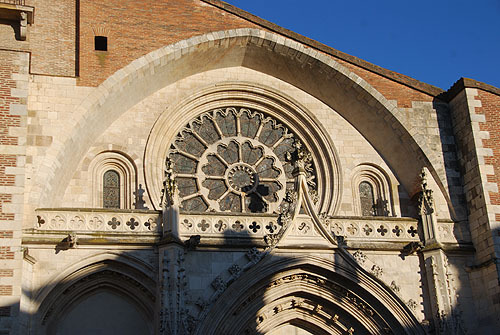 When Simon de Montfort left Toulouse in 1216 the population took the opportunity to assert their independence and welcomed back their Count, Raymond VI. Everyone - men, women and children set about the job of rebuilding their walls, and worked night and day to achieve what seemed an impossible task, to make the place defensible before Simon's return. By the time Simon came back, the city was strong enough to withstand his Crusader army. After almost a year of siege Simon changed tactics and had build an engine called a cat, designed to claw away the city walls. The toulousains saw the danger and focused on destroying the cat. 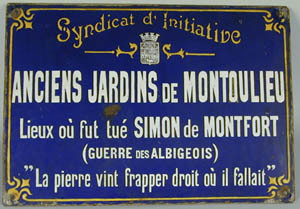 Simon was killed near the porte Montgaillard during a characteristic act of bravery, defending his cat. The scene is one of frantic activity. The people are putting the finishing touches to their defences, using the famous pink Toulouse brick to complete the merlons when there is no more stone. 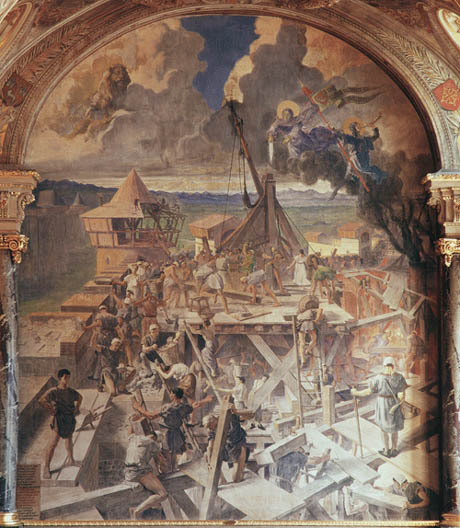 Left of centre carpenters are working on hoards on towers, such as you can see today at Carcassonne. When completed they would have been covered in hides from freshly killed animals so that it would be difficult to burn them. 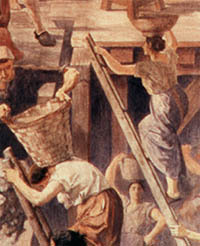 hoards being built at Toulouse. Women as well as men labour to complete their defences. 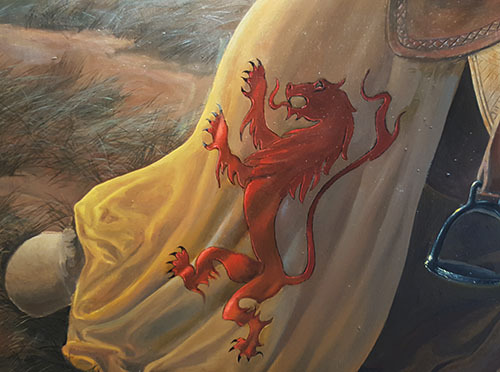 Lurking in the clouds is a lion, representing Simon de Montfort, whose coat of arms features a lion. He is approaching Toulouse. Au loup ! crie une voix. Au loup ! crie encore la voix. Elle saura frapper où il faut. Posez tous sur le levier. To work! cries a voice. To work cries the voice again. It will know where it has to fall. Put it in the sling. 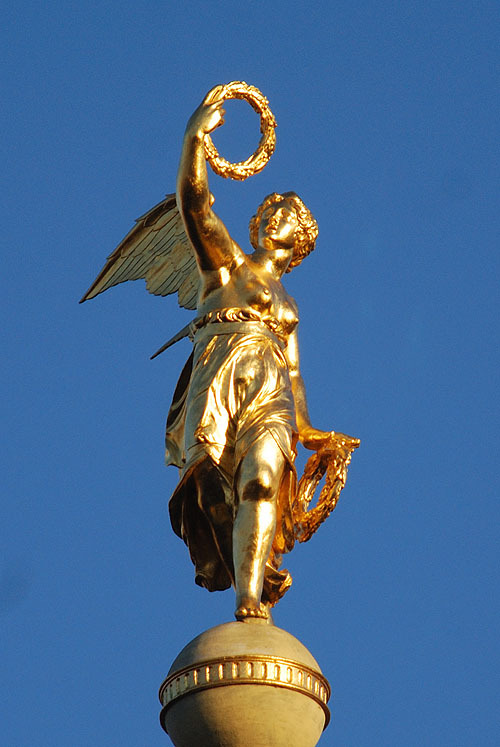 In the sky a herald blows his horn, signalling a call to arms, his halo emphasises that his cause is just. His standard bears the arms of Toulouse removing any doubt as to which side he might belong to. In the centre of the piece is a trebuchet (slightly different from a mangonel), an engine of war used to throw huge stones. Such engines were used by besiegers to breach city walls, but also by defenders to destroy the attackers' siege engines - see right . This trebuchet would have been used to try to destroy Simon's cat. In the picture another heavenly figure wearing a halo points his sword directly at the trebuchet indicating its significance. 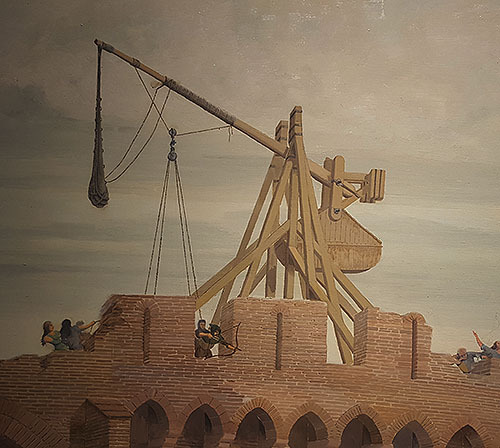 This is the trebuchet, operated by ladies, women and little girls that will kill Simon de Montfort, its massive stone smashing his helmet and his skull so that he will be stone dead before his body hits the ground. Perhaps the anonymous woman in white with her back to us will be the one who fires the mortal shot - she seems to be practising with the firing mechanism. 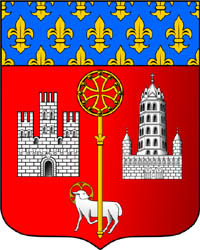 (The arms of both the House of Toulouse and the City of Toulouse flank the painting of the Defence of Toulouse, emphasising the close partnership between them in repelling the French Crusaders). 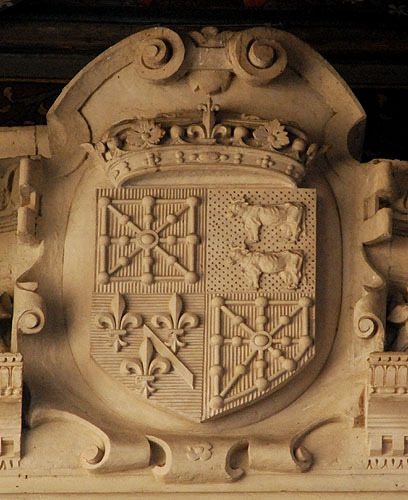 As in the case of the de Montfort lion, the imagery here is drawn from the coat of arms of Toulouse. 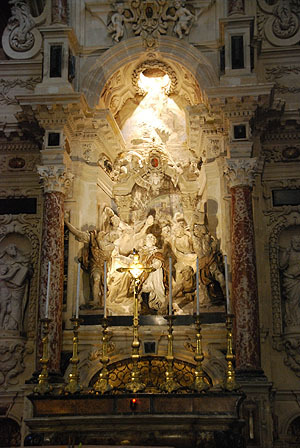 The lamb is a variation of the agnus dei - the Lamb of God. Normally the lamb carries a flag with a simple cross on it. In the arms of Toulouse the flag more closely resembles a spear bearing not just any cross, but the The Cross of Toulouse . 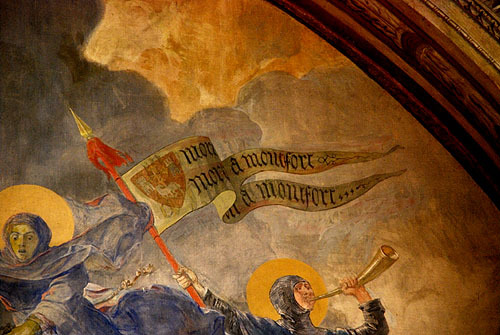 The standard on top of the lamb's spear reads Montfort is dead. 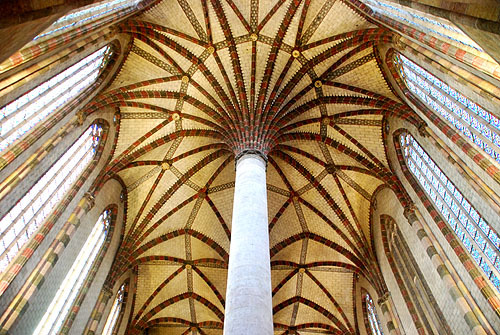 Long live Toulouse (Montfort est Mort (in French). 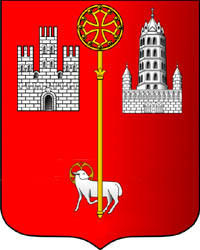 Viva Tolosa (in Occitan)). In the background are the Pyrenees, a reminder of the allegiances of the Counts of Toulouse and their allies, whose world was more closely linked to Aragon than to France. In the bottom right hand corner a figure points at the trebuchet that killed de Montfort. For the time being at least the war is over. 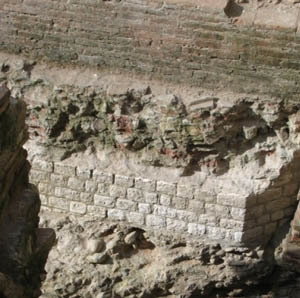 The merlons of the battlements, built in Toulouse brick, are battered but recognisable. The wooden hourds have already been removed - you can see the square holes ("trous de boulon") where the supporting beams fitted. The title refers to the apotheosis - the transportation up to heaven - of the woman who fired the critical shot. She is shown sitting in a chair, being lifted into the sky, a plain and ordinary figure. 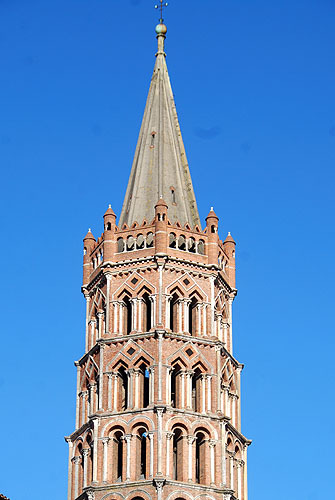 In fact the identity of the person who fired the shot is unknown, for it could have been anyone of the population of Toulouse, and in a sense the figure stands for the whole population, not just of Toulouse, but all Occitania. 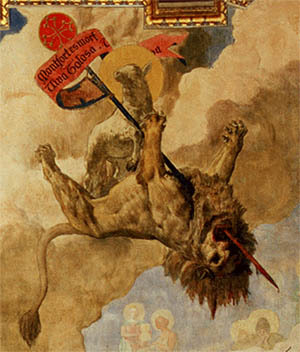 The de Montfort lion is killed by a spear that features in the arms of the city of Toulouse. 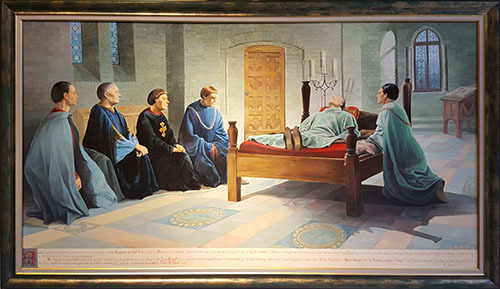 A painting showing Raymond Vi excommunicated. 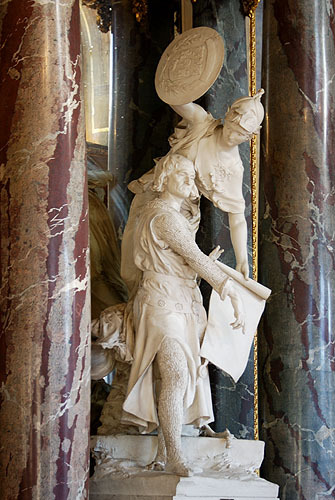 The Capitouls are still trying to get the excommunication lifted. 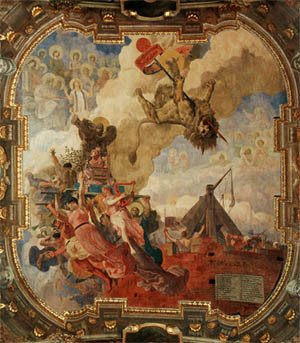 A painting showing Raymond Vi excommunicated (details). 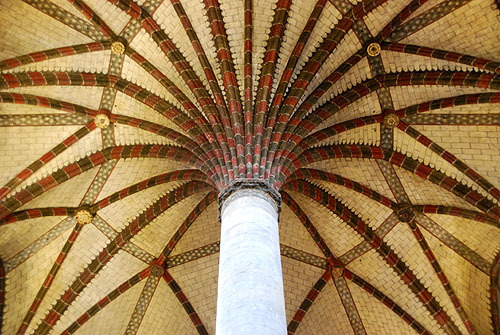 William of Puylaurens covered events relating to the history of Languedoc from the twelfth century to the mid 1270s. 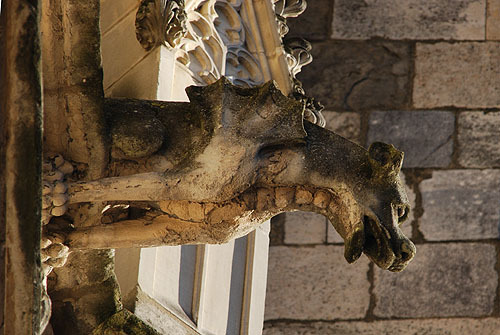 The main subject of his history is the Albigensian Crusade, which lasted from 1209 to 1229. Along with the Historia Albigensis by Pierre Des Vaux-de-Cernay and the Canso de la crozada by Guillaume de Tudèle [The Song of the Cathar Wars or the Chanson de la Croisade Albigesoise], this text is one of the three main contemporary narrative sources for the the papal wars against the people of the Languedoc known as the Cathar Crusade. 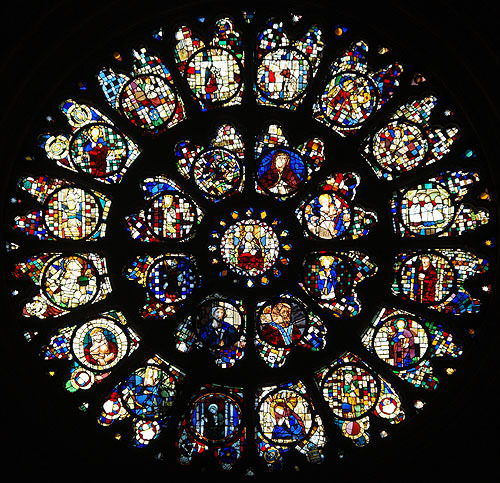 While the other two accounts come to an end shortly after the death of Simon de Montfort in 1218, William provides details about the later years of the Crusade. 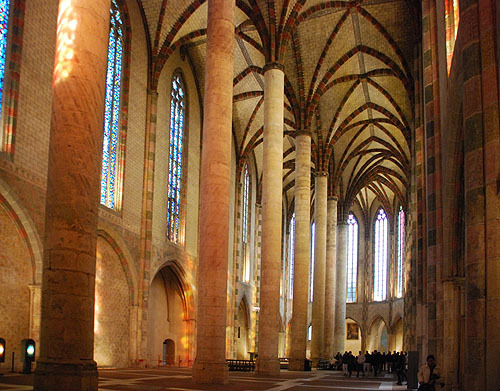 William lived from about 1200 to about 1275, and served in the households of two bishops of Toulouse, as well as Raymond VII, Count of Toulouse. William gives a more even-handed account than either of the other two and, in the words of one historian, his work is "the product an intelligent and reasonable man." The extract below begins with the future Raymond VII, Count of Toulouse, laying siege to the fortress of Beaucaire in 1216. Simon de Montfort hurried there to besiege the besiegers but failed. Heartened by the success of Raymond at Beaucaire other towns throughout the Midi revolted against the French invaders. 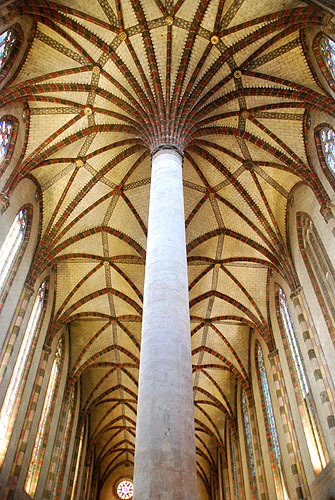 Among them were the capital city, Toulouse. Simon, leader of the crusading forces, subsequently began a siege of Toulouse, which lasted from October 1217 to just after Simon's death during the siege in July 1218. This English translation is from The Chronicle of William of Puylaurens: The Albigensian Crusade and its Aftermath. The translation is by W.A. Sibly and M.D. Sibly (Boydell, 2003). 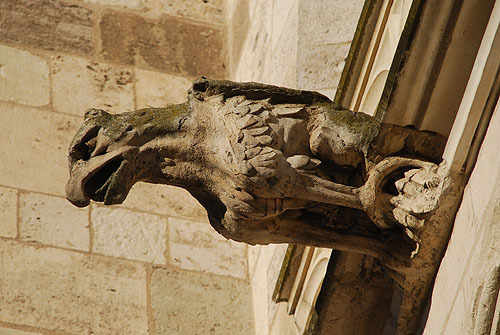 So, after his reception by the citizens of Avignon and the people of Venaissin, the son of the Count of Toulouse entered the town of Beaucaire in strength, with the support of the inhabitants, and laid siege to the crusader garrison in the castle. He invested the castle from all sides, by land and from the river Rhône, so that no one could leave and no relief could reach the garrison from outside. 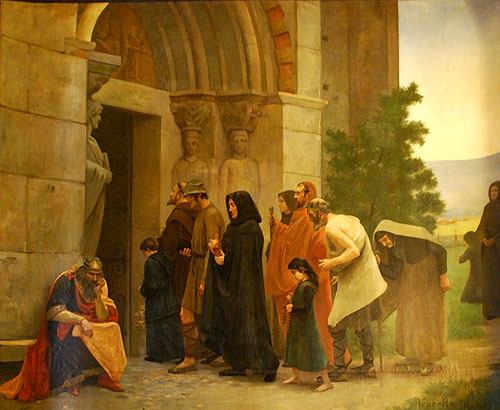 Raymond VI, Count of Toulouse, and his son "Raymondet", the future Raymond VII, were on their way back from Rome where they had attended the Fourth Lateran Council called by Pope Innocent III. 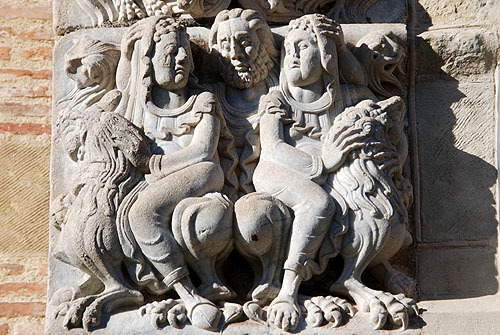 They were greeted with adulation by their subjects in Provence. 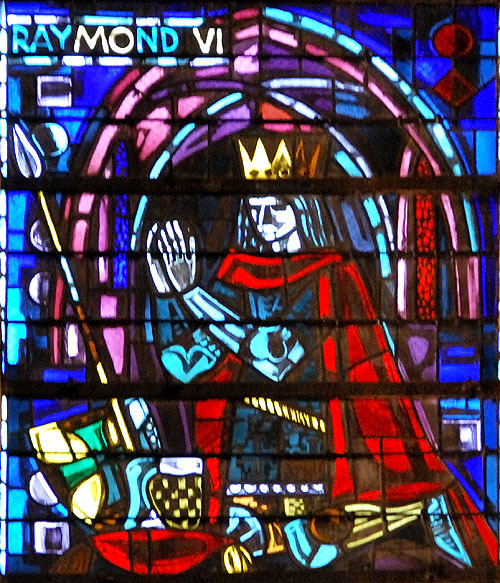 Raymond VI went to Aragon, the eighteen year old Raymondet to Beaucaire. Count Simon [de Montfort] rushed to besiege the besiegers, but after eating their horses and running completely out of supplies the garrison surrendered the castle to their enemies, having received guarantees that their lives would be spared. As his efforts had come to nothing Count Simon raised the siege of the town. As a consequence many who had concealed their opposition to him lifted up their horns, and numerous strongholds and towns at once joined his enemies. For the citizens of Toulouse, whose hostages had already returned home, as I reported above, refused to submit to masters whose rule was overweening and took refuge in a form of disobedience. They bore with difficulty the yoke which undermined the liberty to which they were accustomed. The citizens of Toulouse enjoyed far greater liberty under the Counts of Toulouse than under Simon de Montfort and his French Crusaders. Accordingly Count Simon  fearful that if he took no steps to suppress them they would become as a swelling tumour, decided to oppose them with armed force and punish their arrogance severely. This was Simon de Montfort's normal mode of rule. He had on several occasions taken leading citizens hostage, sometimes using deceit to trick them into giving themselves into his power. So, in the year 1216, the Count entered the Cité with a large armed force. He started fires in several places hoping that the citizens would be put in dread by a double storm, of fire and sword, and thus be more readily thrown into confusion. 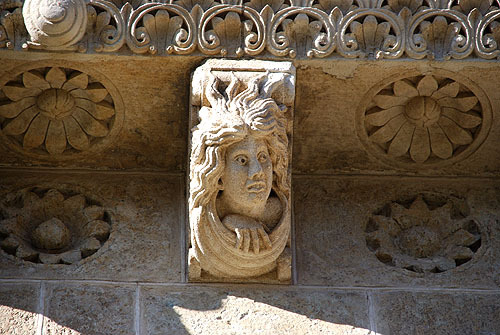 The Toulousians met force with force, they placed wooden beams and wine casks in the streets and repulsed the attackers. All night long they had no rest from fighting fire or the enemy. William is describing ordinary citizens trying to fight armed knights, their troops and professional mercenaries. In the morning the venerable father Bishop Fulk took with him some of the citizens, and in the hope of adverting the impending dangers, mediated between the two parties to secure an agreed peace and sought to blunt the sharp edge of steel with silver. The Count's resources had been exhausted by the expenditure he had incurred at Beaucaire, and he had no money. Seizing on this some of his associates, claiming that it would be of his advantage, urged him to claim compensation of thirty thousand marks, from the Cité and the Bourg  an amount they could well afford  as a means of enabling them to gain the Count's favour. He willingly fell in with this counsel of Achitofel, and, blinded by money, did not see the dangers that might result. For those who gave this advice well knew that levying this sum would result in much wrong being done, to the community as a whole and to individuals; this would drive the Toulousains to aspire to their erstwhile freedoms and recall their former lord. When the levy came to be collected it was exacted with a harsh and cruel pressure; not only were pledges demanded, but the doorways of houses were marked with signs. There were many instances of this harsh treatment which it would take too long to describe in detail, as the people groaned under the yoke of servitude. Bishop Fulk, "Folquet" of Marsielle, Bishop of Toulouse. William is by no means a partisan of the Count of Toulouse. We get a fair picture of Simon de Montfort here. 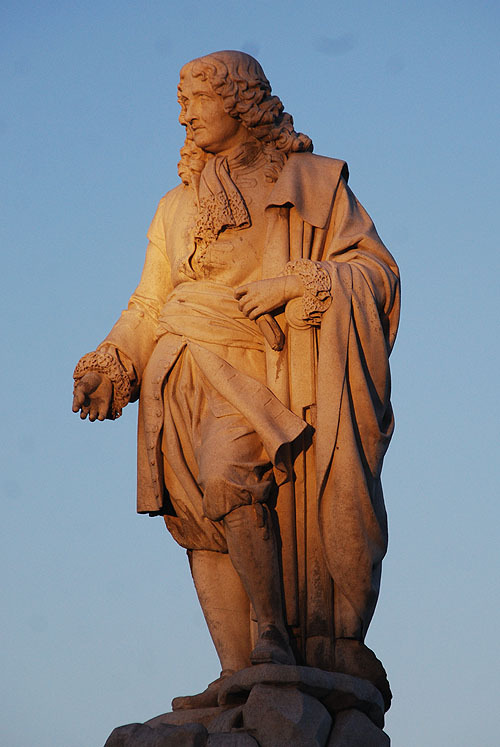 As William says above, even before this, the people of Toulouse "bore with difficulty the yoke which undermined the liberty to which they were accustomed." Meanwhile the Toulousains engaged in secret discussion with their old Count [Raymond VI], who was travelling in Spain, concerning his possible return to Toulouse, so that their wishes might be fulfilled. So in the year 1217, while Count Simon was engaged in a long struggle with Adhemar of Poitiers on the east side of the Rhône, the Count of Toulouse took advantage of the opportunity so created to cross the Pyrenees and enter Toulouse, not by bridge but by the ford under the Bazacle. This was in September. He was accompanied by the Counts of Comminges and Palhars and a few knights. Few people were aware of his arrival; some were pleased, others who judged the likely future turn of events by what had happened in the past, were displeased. 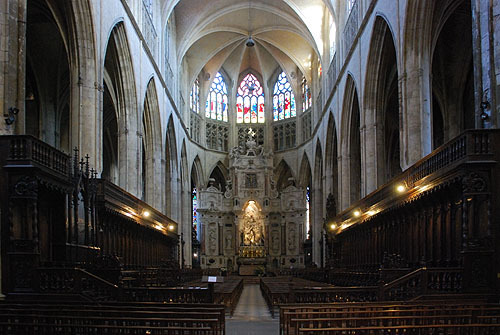 Some of the latter therefore retired to the Château Narbonnais with the French, others to the Bishop's house or the cloister of St. Stephen or the monastery of Saint-Sernin; the Count persuaded them to return to him after a few days, by threats or flattery. The Count Guy, who was in the area, tried to suppress this latest insurrection by force but was repulsed and could not achieve his aims. The Château Narbonnais was The Count of Toulouse's castle & palace at Toulouse. 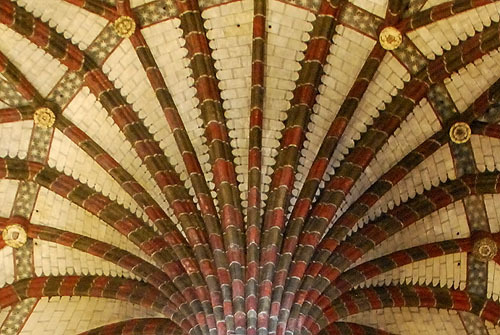 Guy de Montfort (1166-1229), Lord of La Ferté-Alais, Béthencourt, Lombers & Castres , brother of Simon de Montfort. Neither Simon nor Guy was a count, but they were often called Counts by way of courtesy titles. In the meantime, whilst Count Simon, currently engaged in besieging Crest, was being apprised of these events, the citizens began to cut off access from the Chateau Narbonnais to the Cité, with pales and stakes, large wooden beams and ditches, starting at the rampart known as le Touzet and going as far as the rampart of St James. Count Simon now arrived with Cardinal Bertrand, who had been sent as legate by the Supreme Pontiff Honorius, attacked the city with a strong force, but the citizens defended themselves courageously and his efforts were in vain. Then siege-engines were erected on all sides of the city, and a bombardment of mill-stones and other heavy stones was begun. At this time the Château Narbonnais was outside the city walls. Cardinal Bertrand - the Pope's legate. 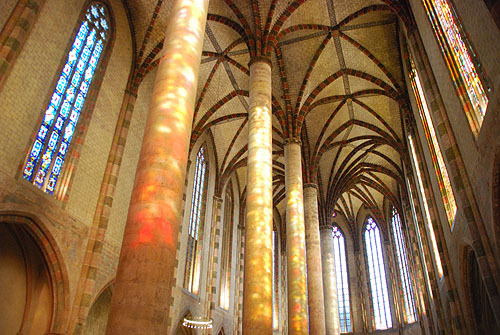 Meanwhile the legate sent Lord Fulk, the Bishop of Toulouse, to France to preach the cross; with him were others entrusted with the same mission including Master Jacques de Vitry, a man of outstanding honour, learning and eloquence, who later became Bishop of Acre and then a cardinal of the Church of Rome. 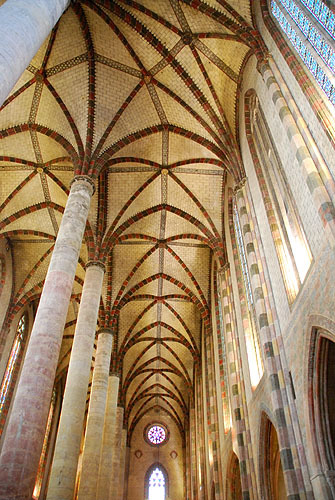 The lord Bishop of Toulouse once spoke to me of Master Jacques, who had told him that he had been enjoined in a dream by a vision of St. Saturnin, the first Bishop of Toulouse, to preach against his people; he referred the matter to the Bishop and asked him if there had at one time been a priest at Toulouse called Saturnin - he had not previously known this. Whenever the Crusaders were losing the Catholic bishops would initiate a new preaching campaign to attract more Crusaders from France. 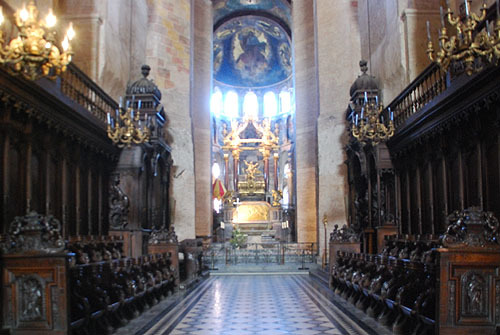 The preaching mission resulted in a great many men taking up the cross; these came to take part in the siege of Toulouse in the following spring, and the Bishop returned to the army with them. 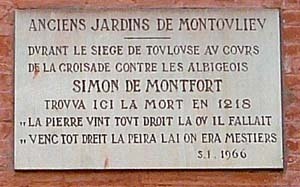 Count Simon now donated to the Bishop and his successors as bishops of Toulouse in perpetuity the castrum of Verfeil, with all the towns and forts which belonged to it and which contained twenty hearths or less; the count retained nothing, and imposed only one condition that if he were ever to become involved in warfare on open ground in the territory of Verfeil, the Bishop would provide him with one armed knight. It was at this time normal for a bishop to hold temporal lordships and provide "military service" under the feudal system - then taught to be divinely ordained. The labour of battle oppressed the besieged and the besiegers alike throughout the winter, as they fought with siege-engines and the other instruments of war. Count Simon, now strengthened by the presence of the newly arrived crusaders, harried his enemies, less by direct attacks on the walls of the town than by excursions around it (which the citizens hindered by erecting barriers and digging ditches). At last it was decided to construct a wooden engine of the type known as a 'cat', which would enable his men to bring up earth and wood to fill up the ditches; once the ditches had been levelled they would be able to engage the enemy at close quarters and effect an entry into town after breaking up the wooden barriers opposing them. However the Count [Simon] was worn out by his labours, despondent and weakened and exhausted by the drain on his resources; nor did he easily bear the prick of constant accusations be the legate that he was unthinking and remiss. Whence, it is said, he began to pray to God to give him peace by the remedy of death. One day, the day after the feast of St John the Baptist, he went into the cat, and a stone thrown from an enemy mangonel fell on his head; he died at once. The news reached the citizens inside Toulouse that day, and they did not hold back from showing their delight by shouts of rejoicing, whilst on the other side there was great sadness. Indeed the citizens were in great distress through fear of an imminent attack; moreover they had few remaining supplies and little hope of gathering their harvest that summer. 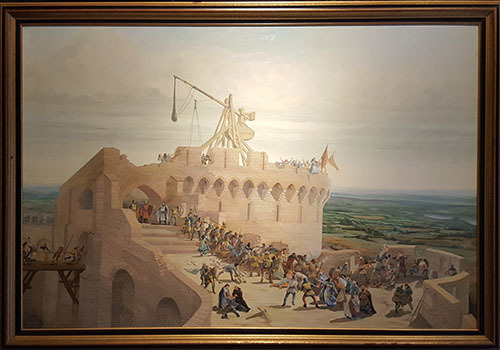 A mangonel was a stone-throwing siege engine. So, the man who inspired terror from the Mediterranean to the British sea fell by a blow from a single stone; at his fall those who had previously stood firm fell down. In him who was a good man, the insolence of his subordinates was thrown down. I affirm that later I heard the Count of Toulouse (the last of his line) generously praise him - even though he was his enemy - for his fidelity, his foresight, his energy and all the qualities which befit a leader. This Count of Toulouse must be Raymond VII rather than Raymond VI. 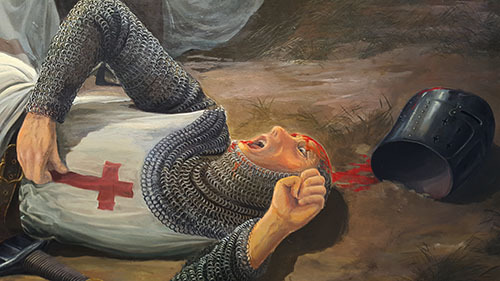 Is is plausible that Raymond would have paid tribute to an exceptionally brave and able leader like Simon de Montfort while remaining silent about the equally exceptional shortcomings of this "man who inspired terror from the Mediterranean to the British sea"